Ice Armor is a Conjuration Wizard skill unlocked at Level 14, freezing or slowing movement of enemies attacking the character. Unlike Storm Armor's effects, which are all damage-adding and not defensive, the benefits of Ice Armor and its rune effects are more defensive in nature. Most of them add damage, though not as much as Storm Armor, but they generally include defensive bonuses as well. Also note that cold damage chills and slows (and sometimes freezes) attackers, providing an added benefit to the Wizard's survival in the form of slowed enemies. Lacking physical armor, a Wizard needs magical protection in dangerous places. This Ice Armor will have a chilling impact upon anyone striking her, cooling them to the point where their movements becomes slower, and limiting their ability to move. The following is a very quick summary. See the Ice Armor rune effects page for a more thorough description of rune effects, or any of the individual rune pages for numbers, screenshots, blue quotes, and much more. Pretty straightforward skill. Useful especially when trying to run away from things, but also if the Wizard is overwhelmed in melee combat, it will briefly Chill or Freeze enemies attacking her. With some rune effects, it will damage enemies as well. The initial casting graphic is pretty cool, as a sort of hexagonal scaled globe rises up from the ground and vanishes over the Wizard’s head. After that though, there’s just a sort of blueish mist around her feet, which isn’t real impressive. As with the other defensive skills, this was just not needed at Blizzcon. I cast it a few times between battles, but never took any hits when I had it active. It was still in the game as of BlizzCon 2010, but moved to Tier 2 in the new tree-less skill system. Skill tiers were removed for the July 2011 Press Event, allowing skills to unlock steadily from levels 1 to 30. Consequently, all skill levels were adjusted and Ice Armor became a level 2 skill. Like all defensive skills, the only reason to use this in the beta is out of curiosity or thoroughness. I did it for both those reasons, and was underwhelmed. It does chill melee attackers that get to you, but so few do that it’s hardly of need. The dangers to a Wizard in the beta come from exploding bosses and ranged attackers. Obviously the utility of Ice Armor may differ in other areas of the game, but those aren’t available for testing just yet, alas. 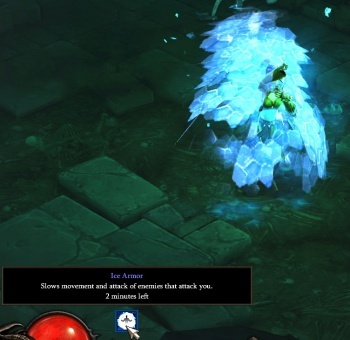 With the Patch 13 changes, Ice Armor was classified as a Conjuration skill and bumped all the way up to level 14, out of reach of beta players. For March's Beta Patch 14, Cold damage was removed from skill, and several rune effects were tweaked. This page was last edited on 12 June 2012, at 21:34.